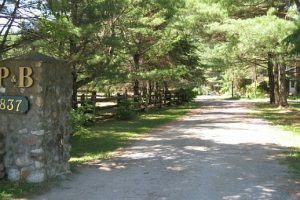 Surrounding our own private 10-acre Pine Lake in scenic rural Quebec, 30 minutes from Ottawa, Pine & Birch Ranch & Retreat offers a unique destination for family reunions, church or corporate retreats and special programs and events. Our accommodations make an ideal home base for any occasion using the Ranch's many amenities. 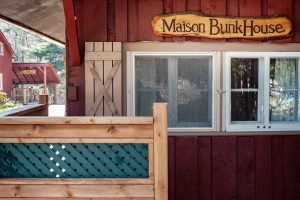 Our housing units include a 2400 square foot, four bedroom Ranch House, a three bedroom Bunk House a one bedroom Cabin and a one-room Cottage. For large groups renting more than one unit, the Ranch House, featuring an open-concept great room functions well as a central gathering space for meals and entertainment. Make your next holiday a Canadiana experience you'll never forget at Pine & Birch Ranch & Retreat! Able to accommodate up to 14 people the 2400 square foot Ranch House has four bedrooms, 2 ½ bathrooms, a spacious front entry, and an open concept living / dining room with cathedral ceiling, massive 18 foot high stone fireplace and loads of windows. With its private back yard overlooking a small pasture beside the stables, this three-bedroom/two bathroom unit has an intimate feel all its own. It has been completely renovated with cherry hardwood floors in the entry, living room, dining room and front bedroom. NOT CURRENTLY AVAILABLE. A newly renovated, frame home, the Guest House captures the essence of country living regardless of which season you choose for your vacation. Just seconds from the private lake, this cozy residence is the perfect place to gather after long days of outdoor activities. 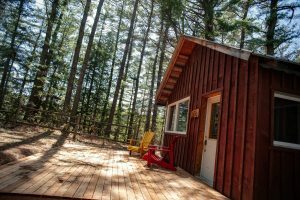 Located amid towering pines in a spot that overlooks Pine Lake, the Cabin, with its natural wood flooring and comfortable ambience, is a special place. Separate from the other P&B R&R residences, the Cabin provides a tranquil getaway. 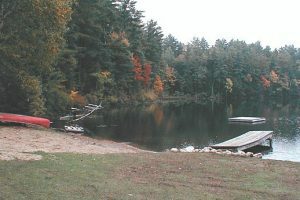 The Cottage is located directly on Pine Lake, just steps from the beach and dock. Due to its waterfront location, it has been very popular over the years, especially during the summer months. 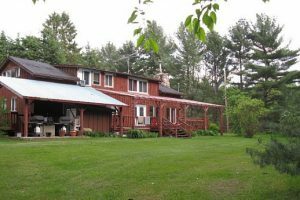 The fully furnished Cottage is a 400 square foot one-room unit with a fully equipped kitchen and a separate three-piece bathroom. This was an exceptional retreat for three old friends. We enjoyed the rustic seclusion of the lake. We took in the local sights of the Lush Cave on Lac Philippe as well went on a 10k walk on the local trails. The owner and property manager were very welcoming and friendly. We plan on returning next year with the family. Bonjour Todd! Un séjour parfait dans un endroit magnifigue! Idéal pour décrocher de la vie trop intense de la ville! Plein de découvertes…Au plaisir d’y retourner un jour! Thanks for a wonderful & restful retreat from the city. We loved sitting by the lake, walking the trails, & enjoying nightly campfires. We had a lovely time and hope to return! From NYC to this place is quite a change. We had a beautiful stay, and found the peace and beauty we were looking for. Thank you for providing a red kayak like in my child tales. Hope you can keep this nature as beautiful as it is. We had a wonderful stay at the cottage. The lake water is fabulous to swim in and we also had a great adventure with the boat! The cabin is really comfortable and really beautifully decorated. We’d recommend exploring the property, walking the trail around the lake and meeting the dogs, horses and chickens! Many thanks, Todd and Melissa! We were so grateful we could send a package to you (for us) beforehand. We loved being so cozy inside with a fire, chilling on the deck with the little one, swimming in the lake, going on a little mushroom exploration, watching the birds, smelling the trees and having a campfire. Next time we must book sooner and stay longer! We had a relaxing weekend, taking in the beautiful colours and tranquil nature of the season. Thank you! Thanks for sharing this lovely property with us. The walk around the lake, the great swimming and relative quiet were restorative. Cheers! We drove in from Toronto and found ourselves totally relaxed at your private lake! What a wonderful spot to be! We recommend Wakfield and the trail to the cave in Gatineau Park. Thank you for providing the opportunity for such a wonderful, warm experience! The cabin is lovely and provides such an intimate nest away from the noise of the city. Having a view of the pond really makes all the difference! We were extremely comfortable here and thoroughly enjoyed ourselves.